is an omnidirectional MIMO 2x2 antenna, working in VV-polarization, it´s desired for LTE connections. The antenna can be used for the most popular LTE bands (3,7, 20), frequencies 698-2700 MHz. On the bottom side the WiSpot has the full IP67 installation compartment, where You can easily install a n electronic board with LTE modem to get the ready-to-use IP67 device powered by PoE (802.3af) - RJ45 waterproof high-quality connector. That antenna is predicted to be installed on the buildings as the client antenna, as the hotspot or on the moving points like trains, buses, lorries, yachts, boats, company or standard cars to receive Internet by LTE. If You are looking for the solution which will give You the Internet access everywhere, that´s the antenna for You. WiSpot OA MMB0727-4V can be installed on the mast, a wall or the flat surface like car roofs. Every WiBOX systems are predicted to use outdoor, they are made of UV resistant ABS plastic material, which is also resistant for bad weather conditions like rain, snow, humidity. Special designed sealing systems guarantees IP67 waterproof level. WiBOX systems can work in any weather conditions, temperature range is from -40°C up to 80°C. Comprehensiveness of WiBOX system installation, WiBOX system can be installed using WiMount mounting system on a pole mast or a wall. WiBOX system has certified IP67 waterproof level. It predicts the system to be used in any outdoor applications on the mast or on a wall. WiBOX system is equipped with top quality RJ45 waterproof system or with standard fee-thru unit to install Ethernet cable to the WiBOX, keeping the waterproof performances. This product was qualified for Made For MikroTik programm, which signify the products MikroTik products friendly. 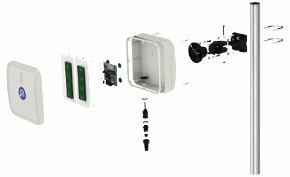 There are the products of antennas with cases compatible with MikroTik Routerboards and other stuff which is predicted to work with MT products. The reason because this product got this sign is a big installation compartment, which gives possibility to install even every electronic stuff available on the market, which makes it possible the most usable and compatible product on the market. WS-OA-MMB0727-4V replaces the folowing EOL products: WiBox PA MMB0727-5V WB-PA-MMB0727-5V.